Who put the environmental groups in charge? Not the California voters. But unelected environmental groups—and their bureaucratic friends in various government agencies—have been dictating energy policy for the most of the past decade. California has a goal of generating half of its electricity from renewable sources by 2030 and environmental groups are calling for the state officials to replace Diablo’s generating capacity with “renewable power sources.” Realize that this one nuclear power plant provides twice as much electricity as all of California’s solar panels combined. Bloomberg Intelligence analysts’ research concluded that PG&E “would need 10,500 megawatts of new solar installations to replace all of Diablo Canyon’s output” and that, without including potential costs of new transmission lines or back-up resources for solar, will cost $15 billion—with totals, including decommissioning, estimated at $20 billion. Talkshop note: But this is only one part of the story. Another part is energy-saving measures in the form of EU-type regulations. When the EU’s high-powered toaster/tea-kettle ban was announced, it became “a lightning rod for public anger at perceived meddling by Brussels”—which was seen as “intruding too much into citizens’ daily lives.” When the ban was announced, retailers reported a spike, as high as 95 percent, in toaster and electric tea-kettle sales. While energy efficiency directives banning Keurig coffee makers would be more likely to draw similar ridicule from Californians, there is a lesson to be learned from the Brexit decision: too much regulation results in referendums to overturn them. It is widely believed that, with Brexit and new leadership, many of the EU’s environmental regulations, including the Paris Climate Agreement, will be adjusted or abandoned. Add to that: at any time of the day or night. On the one hand they say they can and must reduce electricity demand, on the other they want all cars to be electric-powered. Does not compute. The low powered kettle hasn’t had much said publicly in Australia but every time I bring it up the reaction is the same; a blank stare then and indignent query “how on earth will that save energy?” Well it wouldn’t as a moment of thought shows. Tripling the time to boil only increases the heat loss. It should go down as the definite point where the EU went from stupid to outright insane. Why are sail ships no longer used commercially? Have you ever seen a schedule for a cargo sail ship? How long did it take for a solar plane to circle the world? Green brains think that you don’t have to schedule an electricity generation. You just flip the switch up or down, just like that. Especially on a quiet winter night. Think silent night. Re the kettle, the idea seems to be that if it’s low powered the user will be more likely to put in only the amount of water they need, rather than being careless about it. Whether that works out in reality is anyone’s guess. In my experience, the most efficient way to heat a mug of water is to do it in a microwave. But beware that this can cause the water to become locally heated well above its boiling point, so when you put the coffee in the results can be – er – interesting! It is a very good thing for California that we in Washington and Oregon State continue to use the formerly non-renewable energy known as hydropower because without it the Pacific DC Intertie would be impossible as would be life in blissful Lala Land. After much debate hydropower was finally deemed renewable in 2012. Because it was not considered renewable we qualified for federal money to build the ugliest windmills the world has ever known. 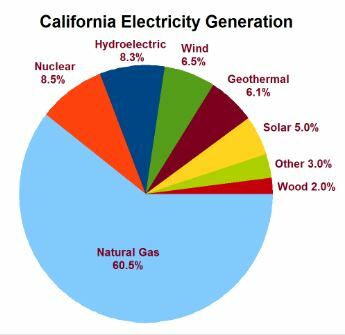 Most of California’s electricity (60%) comes from natural gas. While I am in favor of advanced nuclear reactors, I have no problem with electricity generated using natural gas which we have in abundance. why not boil one sip at a time? that would eliminate waste surely and save a pile of energy. gallopingcamel – methane storage is problematic compared to oil, coal and uranium. The switch to gas generated elctricity leaves the grid much more vunerable to outages due to lack of fuel. Cleaner burning, absolutely, but certainly not a robust solution for the grid. Pipelines are not equal to miles of railcars loaded with coal. California will see rolling brown/black outs this summer because of the reliance on gas and so called renewables. California is an interesting place. I am a native Californian, and voluntary Floridian. At the moment, I am “Bi”. (Oh, pardon… bi-coastal). So Gov. Gray (out) Davis entered history as the first Climate Refugee and political suicide in one. So Diablo Canyon shuts on schedule in a dacade-ish. Probably more to do with cold fusion now shown to work than much else. PGE got an extension and dodged upgrade costs faced with a change on the horizon. Good for them. I still have my Gov. Gray (out) Davis generator. Any dropouts will be filled by gasoline without pollution controls.. Did I mention “California, land of fruits and nuts”? Welcome to California… now go home. I was in on the ecoloon California drive for alternative energy sources back in the 1970s during the first reign of “Moonbeam” and his friends. Solar, Wind, Biomass, small hydro, geothermal, you name it I studied it, did the engineering, Ran the ROI numbers, even built a few. The results were always the same. Maybe ok for special requirements but really a STUPID WASTE of resources for Industrial levels of energy production. Without Government coercion and funding they get scraped. Enron was built on the back of this earlier push and then crashed as the Ecoloon manic wave died down as the money dried up. Enron created the next Ecoloon wave to enrich it’s self, specially on Carbon Trading, but collapsed before they could start. That wave went on without Enron, and CalPers, the State Government retirement fund, nearly went broke because they had invested heavily in the scam. The University system was infested with Ecoloons that preached how wonderful their new world would be when this “Alternative” energy source had replaced “fossil fuels”. Things kind of died out in the 1980s but these Ecoloons went into teaching, spreading the wonders of their Religion to a new generation of world leaders. Mr Smith tells of governor “Greyout” Davis and his attempt to help CalPers recover by helping PG&E Corporation to loot $6 billion from the Pacific Gas and Electric rate payers accounts as well as additional $billions to Enron’s power management players as they manipulated artificial electrical power shortages to gain maximum rates. Crony Capitalism at it’s best. note; PG&E Corporation is the controlling owner of Pacific Gas and Electric Company. It was created to facilitate the looting. As they have said for 150 years “California has the best government money can buy!” and It is always for sale. So you can see that we have played this game before with the same results. IT IS A SCAM! always was. With lots of STUPID but useful people selling their religion. It seems to me that a slow boiling kettle must use more juice than a quick one. It is losing heat all the time it is slowly coming up to temperature and so it must use more electricity overall. The quicker it boils the less heat is lost in the process. It seems like the people who make these regulations can’t do simple sums. Simple sums are all that is needed to make Green thinking look stupid. Engineering is not a strong point for woolly-minded so-called environmentalists.